My friend Paula from More Than Favors asked us to link up a favorite project from 2011 and of course I had to share my gift box. 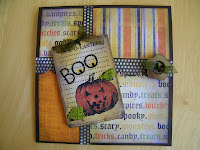 I made it this summer when I was a featured designer for GCD Studios in August. 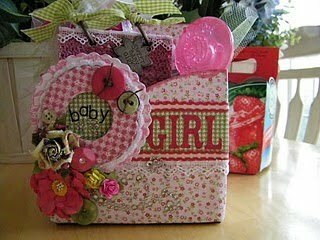 I love the paper and the fun idea that I came up for a baby girl gift. 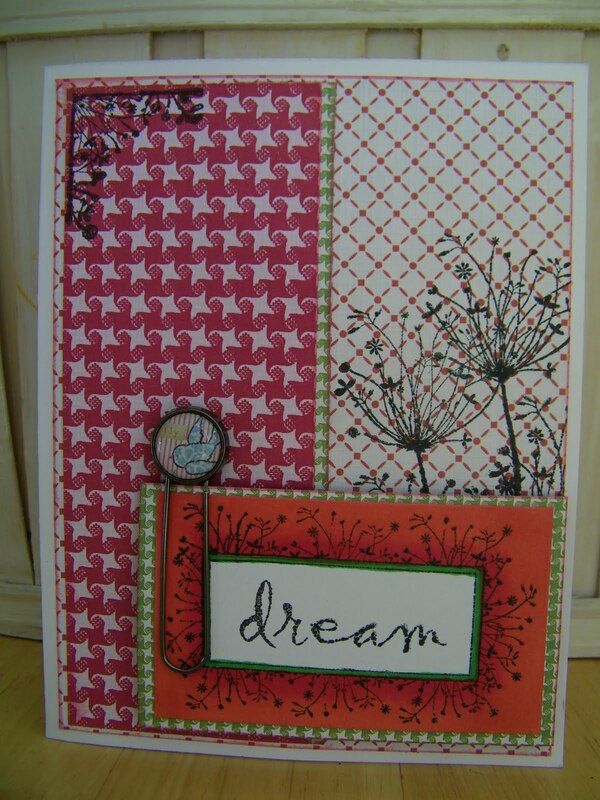 The details from all of the embellishments that come with the paper line are amazing. This little book fit perfectly into the side pouch of one of the bottle slots. Of course I had to cut the center divide out from the middle for it to fit. I add some fun little gifts in the remaining pockets. The sentiment is a rub on that I found. 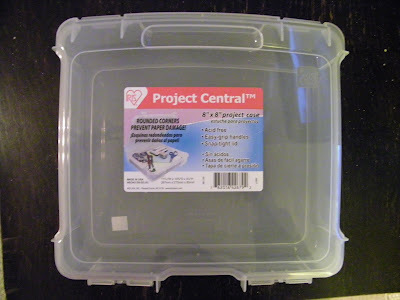 For more details on the box please go to the August 13th post. It is amazing how fast the year has sped by. 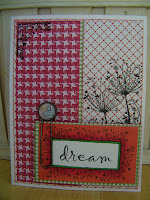 I thought I would share a few of my favorite cards since I was asked to join in on the "My Top Ten 2010 Cards" Blog Hop. 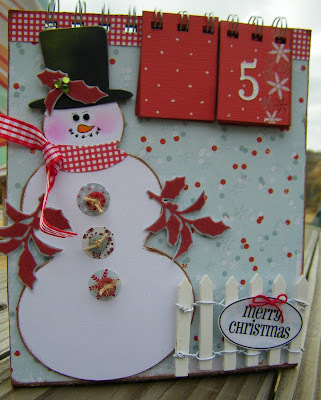 Make sure to hop over to My Top Ten 2010 Cards Blog Hop to start the hop, there are a lot of amazingly talented people out there with lots of fabulous ideas. Hope everyone had an amazing Christmas and have great excitement about the New Year. 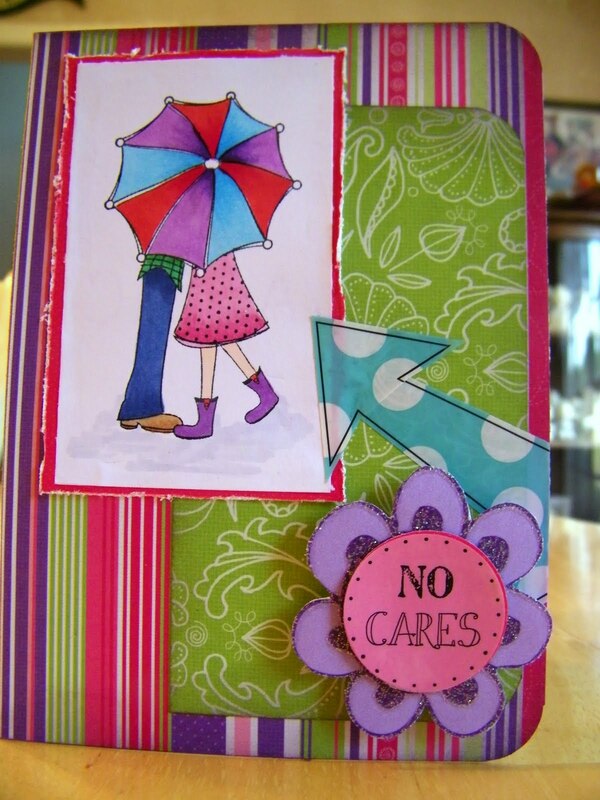 I have already started making my Spring projects. I made this card using the new Little Yellow Bicycle Valentine collection and this sketch from Page Maps. 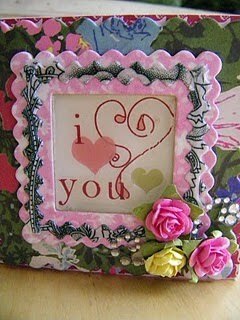 I selected Little Yellow Bicycle Mini Plaid Multi, Valentine Card Cut Outs, and Heart Cut Out papers. 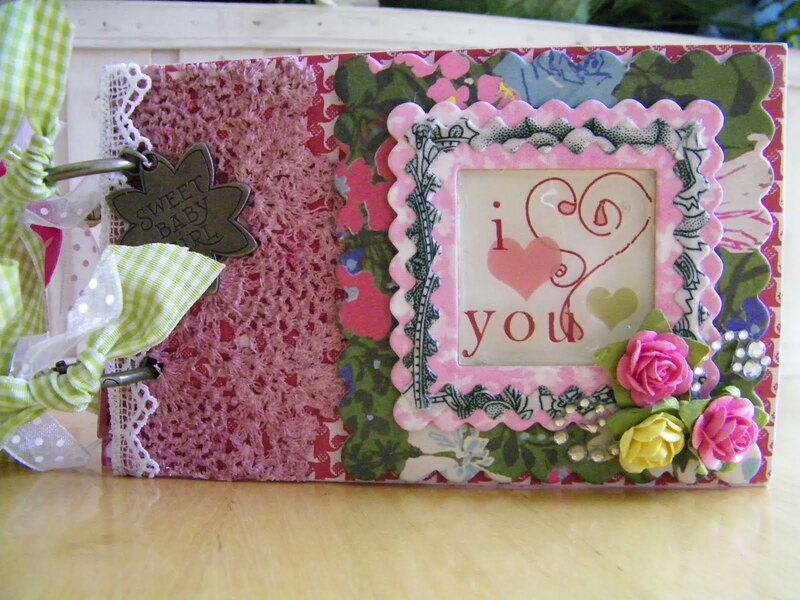 I did an accordian folded rosette for the front of the card and used some SRM Valentine stickers for the front of the card along with some ribbon and the tiny attacher stapler. 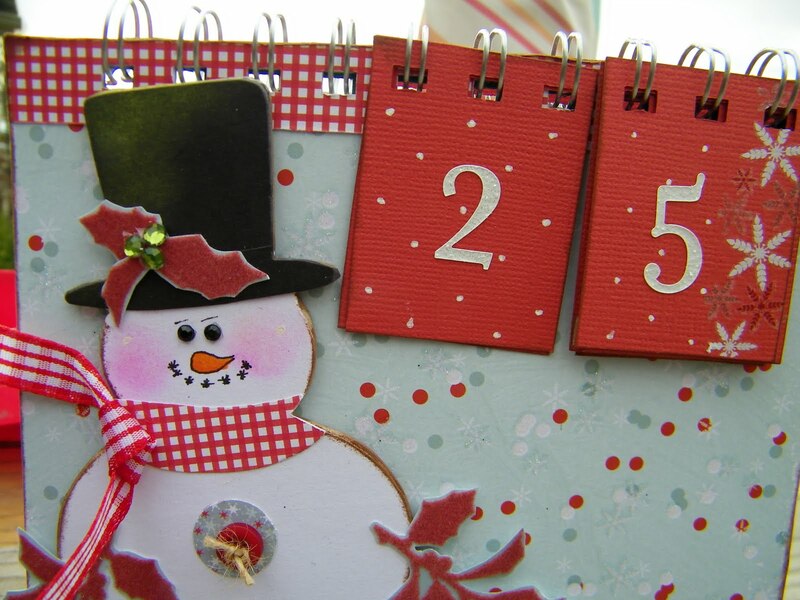 Christmas Cards with Bo Bunny Noel and a Page Maps Sketch!!!! 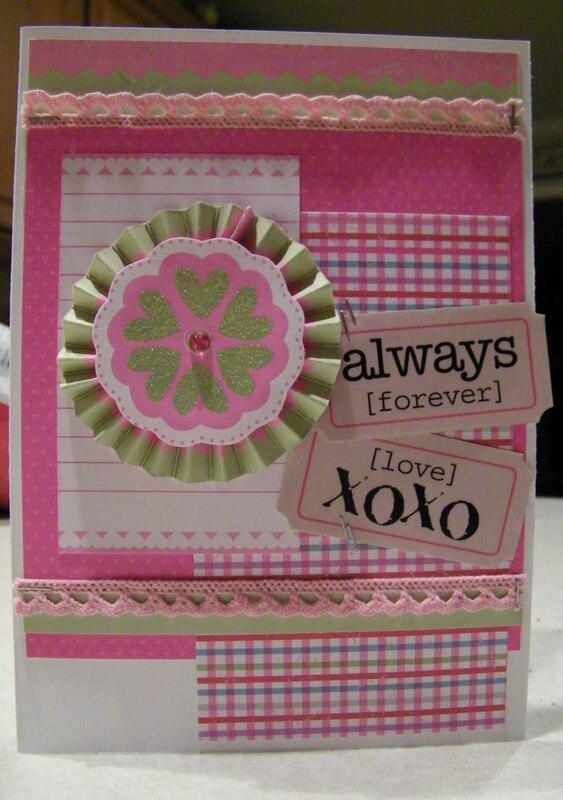 I made a card using the Page Map sketch that was featured on Paper Patch Crafts . I just fell in love with the sketch and after I did the challenge I decided I would use the sketch and do my Christmas cards for my co-workers. So this is my interpretation of the sketch. I used the Bo Bunny Noel Collections: Memories, Traditions, Rejoice, Dot and Holly Papers. My stamp was Holiday Cheer by Hero Arts and Black Memento Ink. I used some brown tassel ribbon and my Tim Holtz Tiny Attacher to attach the ribbon to the bottom of the card. I used Glossy Accent on my berries that I had fussy cut from the Holly Paper. 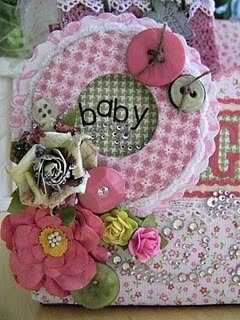 I have a tutorial on a past post on how to make the rosettes but if you would like more information please let me know. I just hope my co-workers enjoy their Christmas cards. *Remember to post a comment, become a follower and leave an email when I reach a 100 followers I will be sending out a suprise package." Imaginisce "Enchanted" Container and a Giveaway!!!! WELL I am going to have another giveaway. 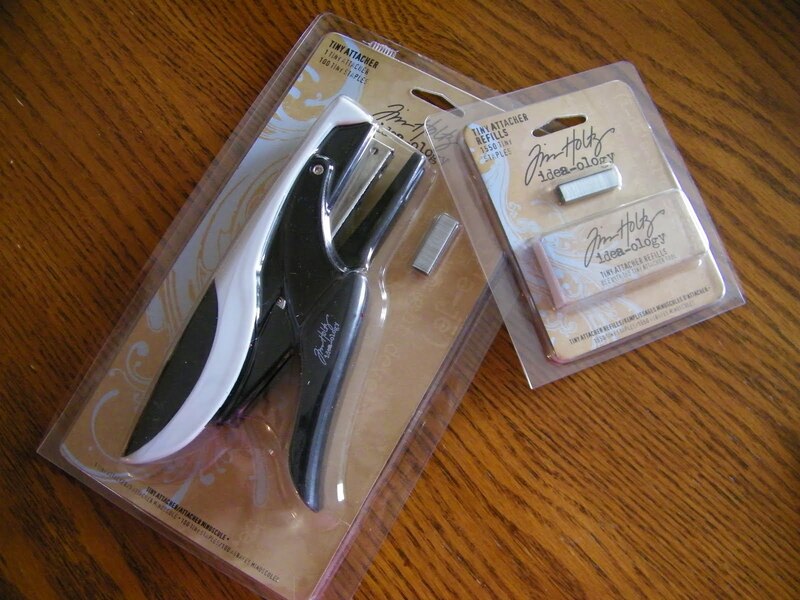 I am almost to 100 followers and to celebrate I will be giving a surprise package of extra scrapbooking supplies I have ...some buttons, ribbon, paper, mini album etc -so help me spread the word. 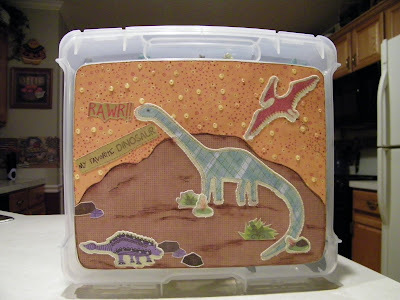 I made a container and posted it on Dec 13th using the Imaginisce Dino Roar Line and a 8"x8" container for one of my grandsons but you know when there are two children in the home one can't have something without the other one getting it. "Let just say" I just had to make his sister one also. 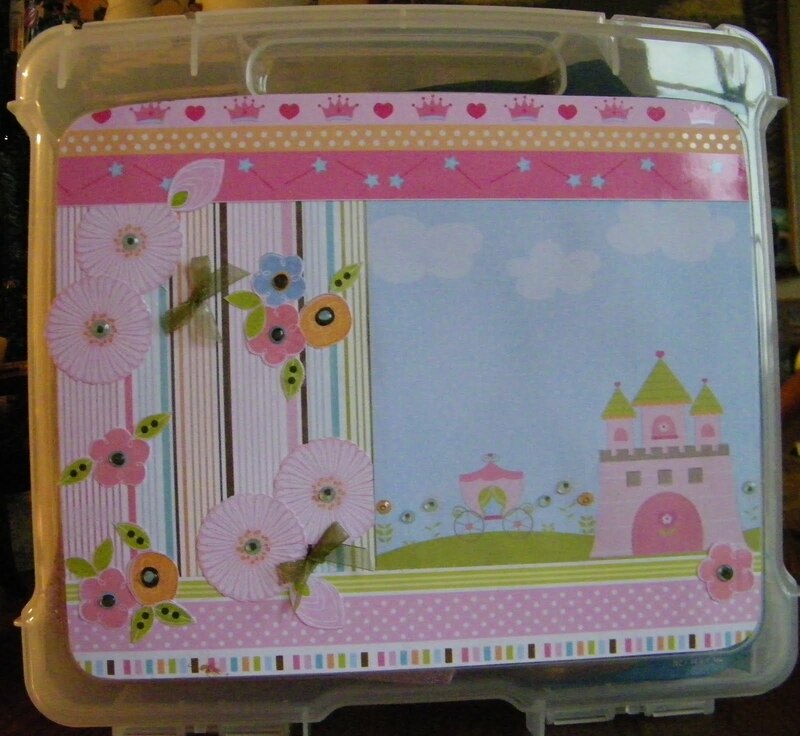 I used the Imaginisce Enchanted collection for hers and filled it with cooking goodies. I think she will really enjoy it. This is the one I did for my grandson in case you missed it and would like to make one just scroll down to a previous post. For the Enchanted container Iused the "Enchanted" Fairy Trails and Princess Promenade Papers along with a 8"x 8" Iris container, 2 way tape, Glossy Accent and some 1/4" Sheer Ribbon. 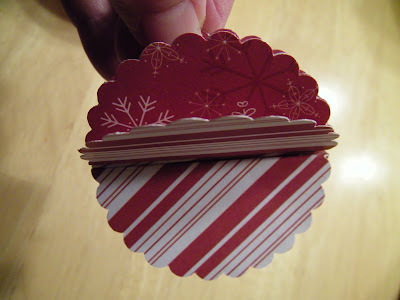 Just cut your paper to fit the top of the container, decorate and place on top of your container using the 2 way tape, finally add Glossy Accent to the center of the flowers and allow it to dry. I added my bows as the last detail. *Remember to share my blog on you facebook, become a follower and leave a message for a surprise package as soon as I hit 100. Good luck. 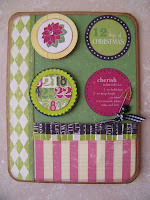 Pam"
I can't thank Jess enough from KinderStampO for hosting the "Its A Small World" Holiday Blog Hop on Dec 11 and 12. I received many very sweet comments about the "Jesse Tree" and many that said they were going to add it to their family traditions. 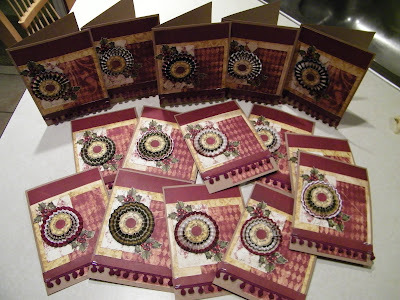 If you would like to learn more about the "Jesse Tree" please scroll down a few post and you will find the history behind it and a tutorial on how to make the envelopes. That in itself is very exciting. 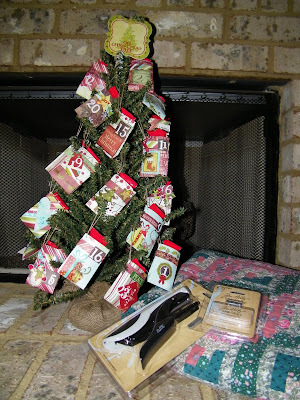 I selected the winner by asking my husband that was eating his favorite meal "Popeyes" Fried Chicken to give me a # between 1 and 58 and the lucky # was comment 44, so without any further waiting the winner of the Tim Holtz Tiny Attacher and staples is Theresa she said...Love your tree..it so sweet, and it was wonderful of you to share the story behind it. Thanks so much. 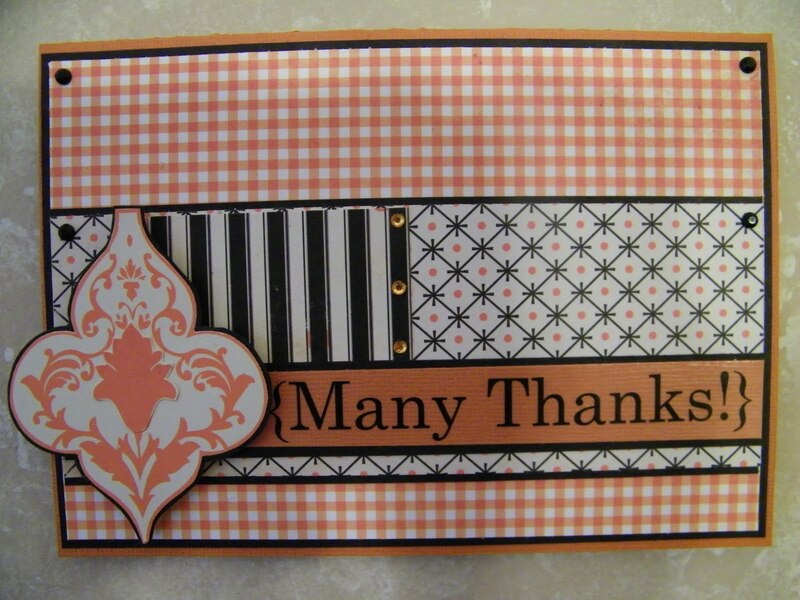 Again thank you so much to those of you who have decided to follow my blog and leave such sweet comments. 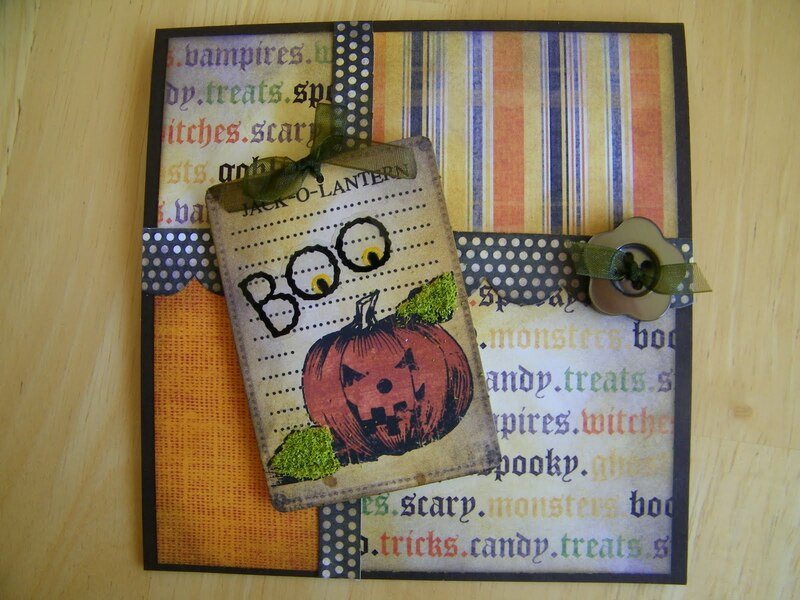 I hope you come and visit often and I will continue to have exciting ideas, projects and tutorials along with a little blog candy to share. There will be more hops in the future so please stay tuned. I thought I would share my project that I made using the Imaginisce Dino Roar Collection. It started with these 5 dinosaurs I picked up for one of my grandsons at Michael's for Christmas. I thought what can I put them in to make them special and then I found this 8"x8" container from Iris. 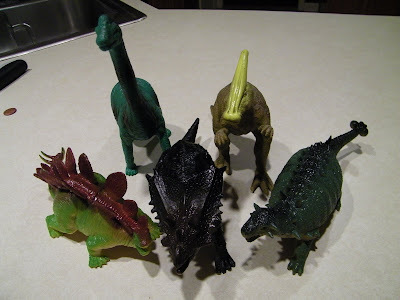 All five dinosaurs fit in it perfectly. So that is how my project began, I knew that Imaginisce had this fabulous paper called DinoRoar and it would be perfect. 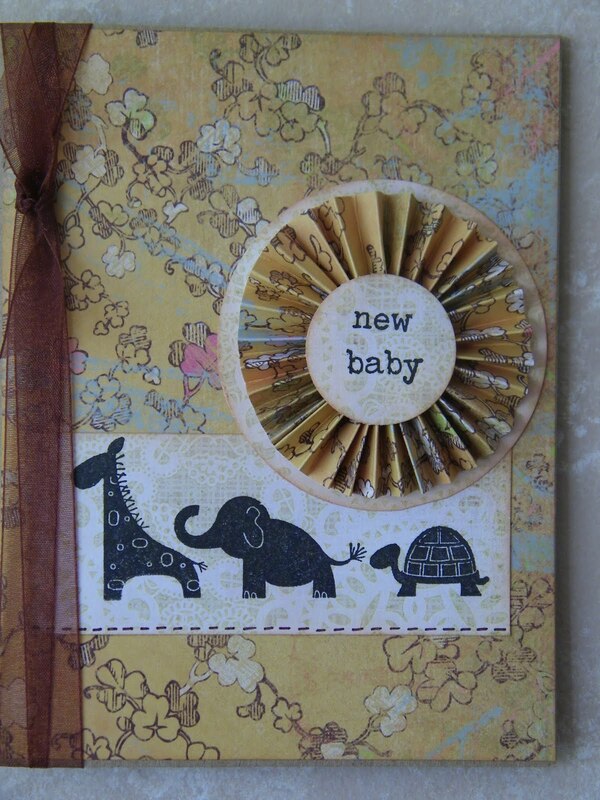 I used Bedrock, Petrified Wood, Primordial Ooze, Stomping Ground and the Denim Stickers for my front. I glued my paper to the top of the Iris container with Two Way Tape Sheets. 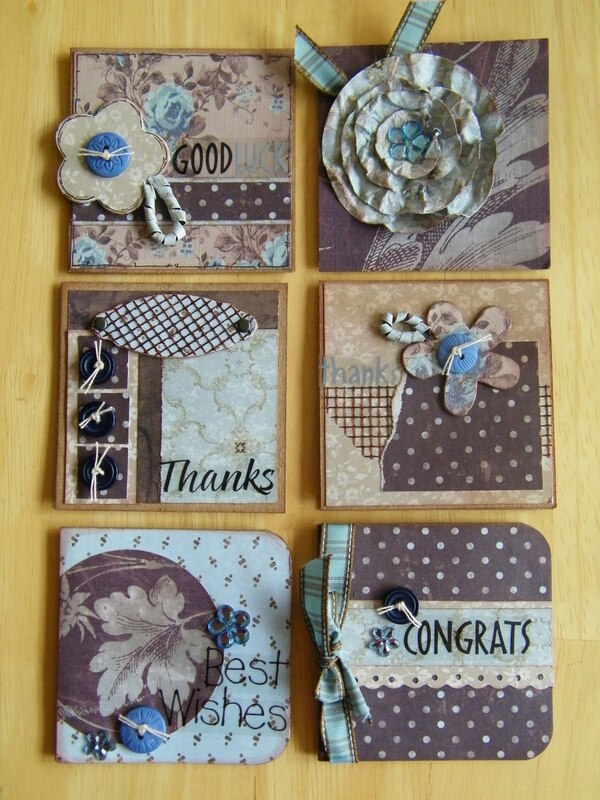 First, though I inked all of my paper pieces before I glued them onto the paper using Vintage Photo Distress Ink. I did a little line work using my Black Zig Pen and some Glossy Accent on some of the dots on the Stomping Ground Paper. I am sure when my grandson sees his container he is going to love it and the best thing is my project cost me less that 15 dollars. 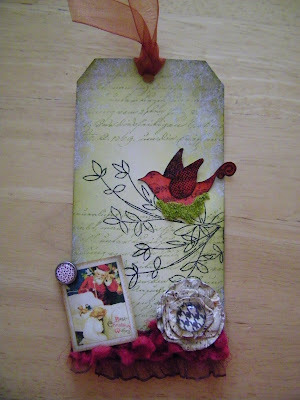 Here is my take on Tim Holtz Tag 6 design. I had to draw and cut my trees and deer from grungepaper because I didn't have either of the dies but I can always count on my printer and computer to help me out with this. I do like to make my tags look close to his that is what I enjoy most is using what I have to make something close to what he did. Again, I didn't have a lot of the products that he used but I think my tag turned out pretty nice. 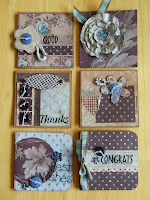 Instead of using the embossing folder technique that Tim shows on his blog (I will be trying it as soon as I find a folder that will work) I used a filligree stamp and gold embossing powder for my background and then did the inking using Broken China and Frayed Burlap. I inked my trees with Faded Jeans and Peeled Paint. I added some green stickles to the left side of the trees. My deer is done in Faded Jeansand the antlers are inked with Vintage Photo. 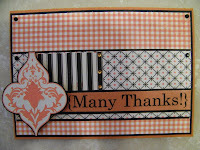 Graphic 45 paper tape is the trim I placed at the bottom of my tag along with the Season Greetings that was embossed with Distressed Red embossing paper. I added some brads, metals and ribbons to finish my tags. Can't wait to get the other 6 done. KinderStampO "Its A Small World" Holiday Blog and a GIVEAWAY!!!!! 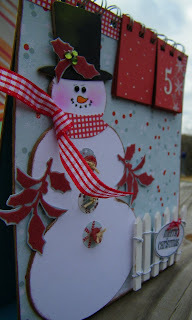 I was excited to be asked to join in the "Its A Small World" Holiday Blog Hop that KinderStampO is hosting. 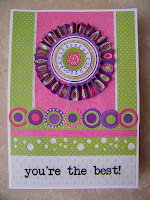 If you have started on my blog please go to Jess' blog at KinderStampO so you begin at the beginning of the hop-you sure don't want to miss anything and from what I am hearing there is a lot of amazing projects showing traditions from around the world and holiday treats in store from her sponsors: Unity Stamps, Peechy Keen Stamps, Lindy Stamp Gang, Preserve Your Memories II, Imaginisce, Helmar... to mention a few. So you should of hop in from Madison blog to mine. I selected Switzerland for my country but as I researched it became more like an European tradition of the start of Advent. I wanted to do something a little different for an Advent idea and decided to do a Jesse Tree. A Jesse Tree is based on prophecies from the Old Testament and how it related to the New Testament - from the start of creation to the birth of Christ. It is also based on the scripture that reads Isiah 11:1 "A shoot will spring forth from the stump of Jesse, and a branch out of his roots." 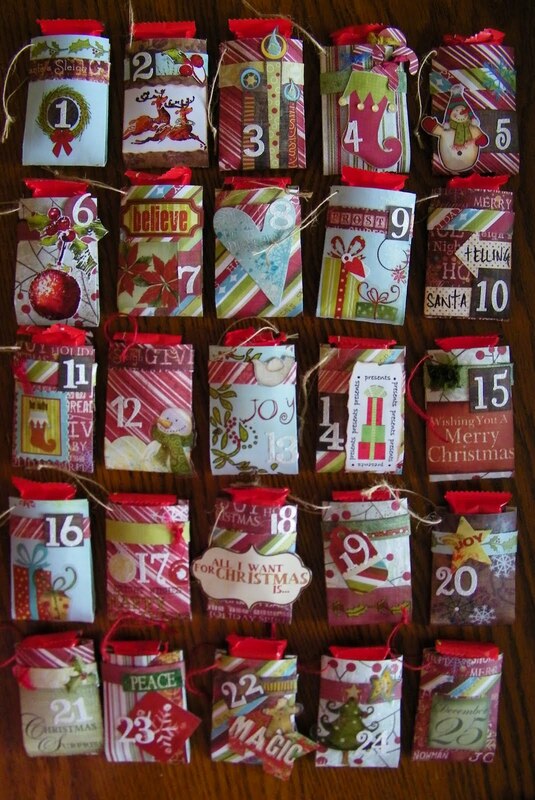 The advent using the Jesse Tree focus on a daily devotion and a small treat is given. Advent is a time of anticipation of the coming of Christ. 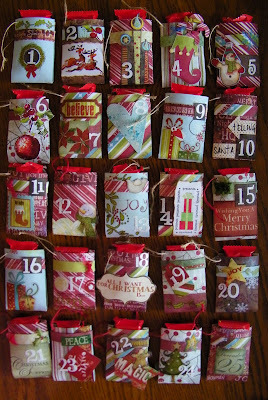 Advent is a European celebration that is also became a tradion here in the United States and other parts of the world. I started my project with a 3 foot tree that I purchased at our local Hobby Lobby, an envelope that I made, a tiny attacher stapler, Fancy Pants Traditions and Christmas Magic papers, Making Memories Cheeky Shimmer Letter Stickers and random stickers and embellishments. 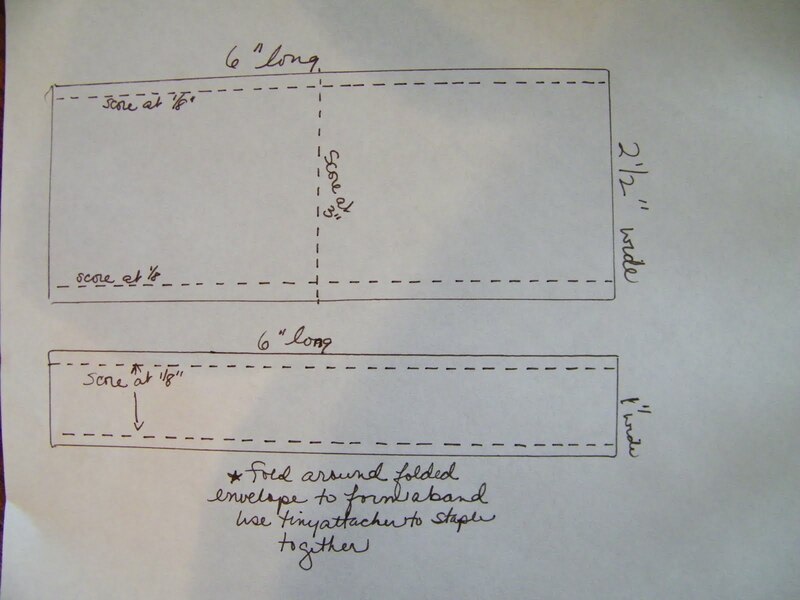 The envelop measure 2 1/2" by 6" and are scored in half. Then they are scored 1/8" on both sides. The band is 1" by 5 1/2" and folded around the envelop and secured with tiny staplers from the tiny attacher. I made my 25 envelopes and added my devotions and a KitKat to each envelope after I got them decorated. After I got all of my envelopes decorated I tied tan and red twine to them and hung them on our tree. 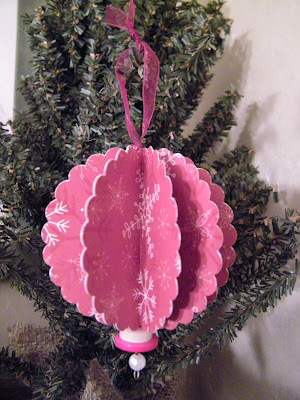 The tree topper is a sticker that I placed on chipboard from the Fancy Pants Traditions Element Stickers sheet. Make sure to become a follower,leave a comment and a way to get in touch with you for a chance to enter my drawing. Did you see it under the tree!!!! A present of a Tim Holtz Tiny Attacher and a package of staples so you can make your very own Jesse Tree!!!!! The other links just in case you lost in the line up. 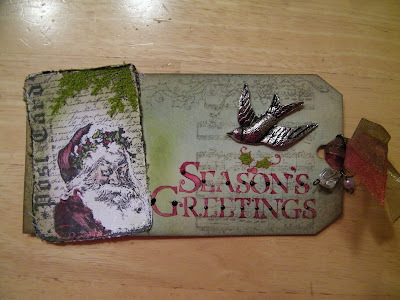 Here is my take on the Day 4-Tim Holtz 12 Tags of Christmas. 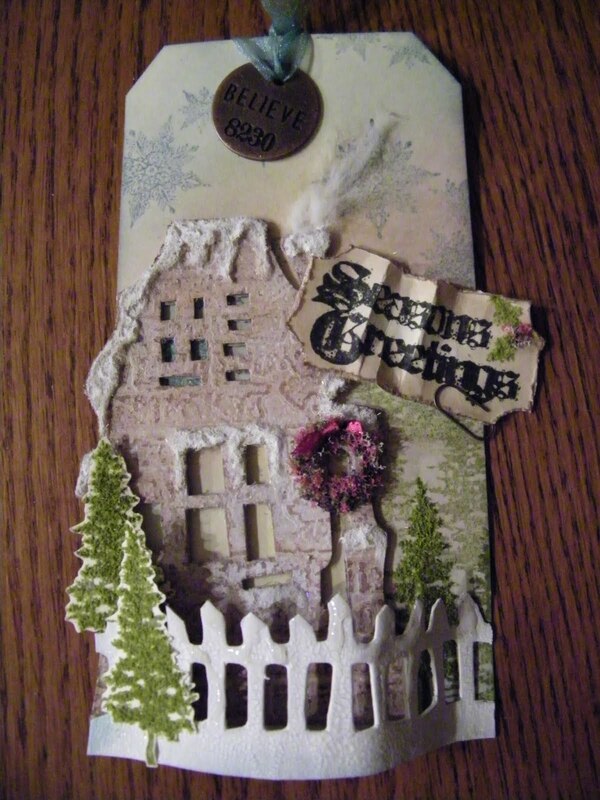 I used a postcard from the Graphic 45 Christmas Past Collection. I think it turned out beautiful. 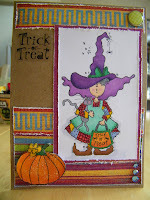 I love the technique of the alcohol ink and Archival Black ink technique that was used on the facet. 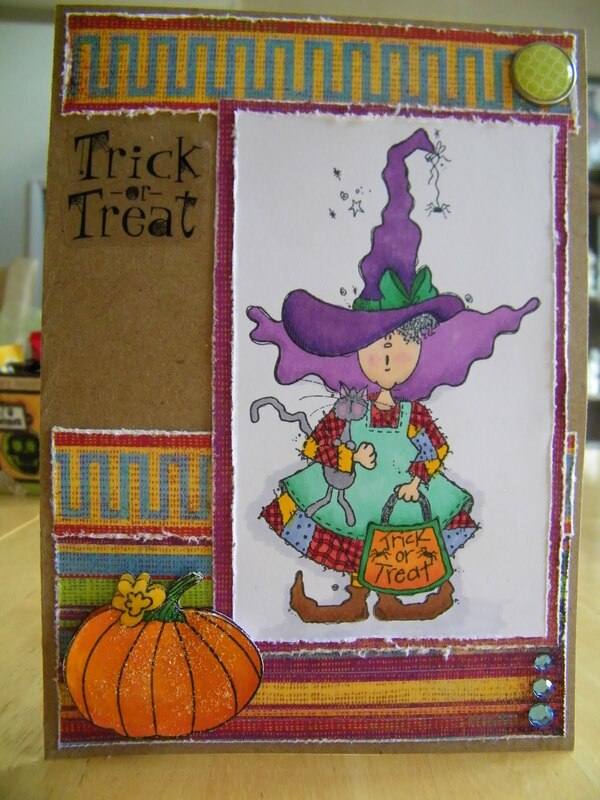 I used Archival Coffee Ink on my facet along with Raisin alcohol ink since this what I had on hand. Tim tag was predominately blue, so to keep in the theme of the color I did my distressing in the Faded Jean ink, but as you can see my tag is predominately red. Make sure to checkout his blog and see the differences in the tags and let me know what you think. Don't forget to leave a comment and entry a chance to win a prize for the day over on our friend Tim's blog. This is one of my unfinished projects from last year. I sure hope I am not the only one with several projects laying around. I thought I would get it finished and uploaded before the month of December got away from me. First I cut several small squares measuring 1 1/2" x 2 ", decorated them and then I used my Bind It all for all of my holes. My stand is made from Chipboard. 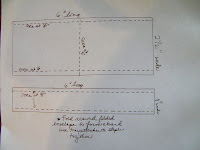 I cut two pieces to measure 7" x 6 and one piece to measure 2" x 6 (this is your bottom piece). Cut two pieces of cardstock 8 1/2" x 6", score the 8 1/2" length at the 2" on your scoreboard. 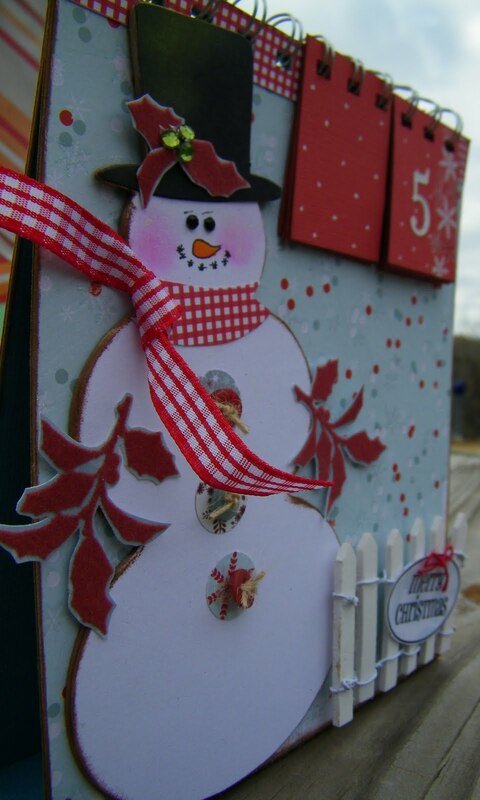 Glue the one large piece of chipboard on and also the 2" piece of chipboard where you just folded it. Now do you second piece only this time when you do the glue to the 2" piece do it on the opposite site. Here is your stand. Do you bind it all holes, added you decorated number pieces and then squeeze it together. 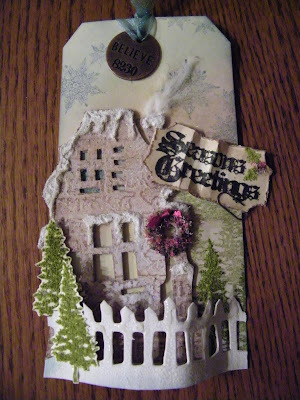 I covered the front of my project with SEI Winter Song Flurry Kissespaper. Here is one look at the dimensional view of the project. 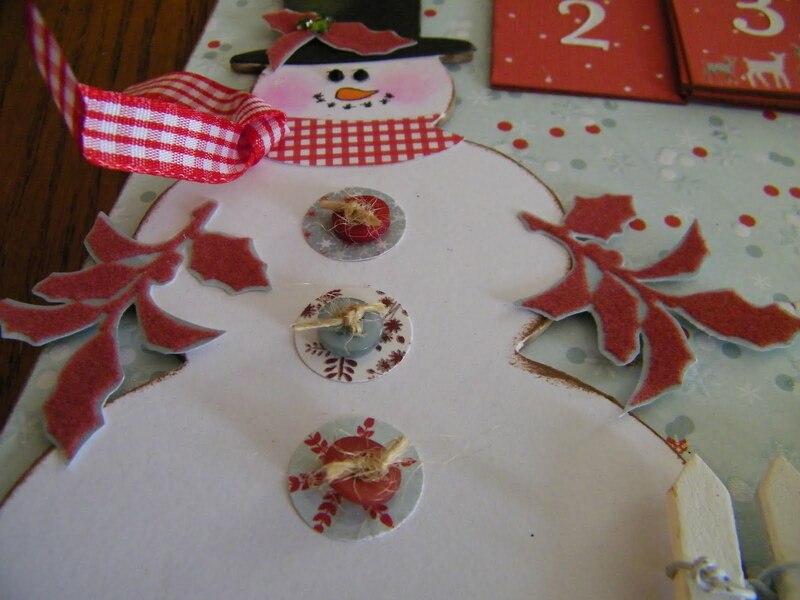 I added buttons, 5/8" circles, fussy cut some of the holly leaves from the SEI Winter Song Sweet Holly strip sheet, added some gemstones for the holly berries and eyes of my snowman. I also did a little chalk for the rouge of the snowman's cheeks, Copic marker his nose and outlined it and his mouth with my black zig pen. I add a paper bow to the neck and ribbon for the scraf tie. Here is a closer look at the SRM Sticker that I used on my fence that I added to the bottom of my project. I can always count on SRM stickers to finish dressing my projects up. 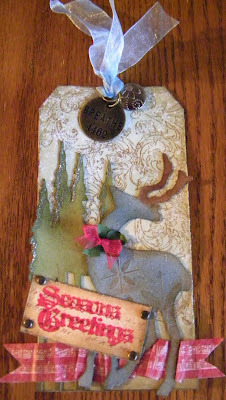 I couldn't resist I wanted to do a tag using the techniques from the Tim Holtz 12 Tags of Christmas blog post. 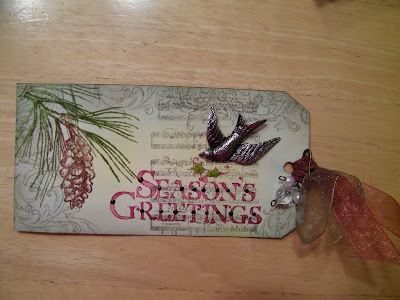 So you guessed it I bought a pine cone stamp, not the one he used, I couldn't find it but I did like this one from Inky Antics and I also got some Clear embossing powder and it turned out very nicely. I added the birds but I got them at our local Hobby Lobby and I think they work out very well. 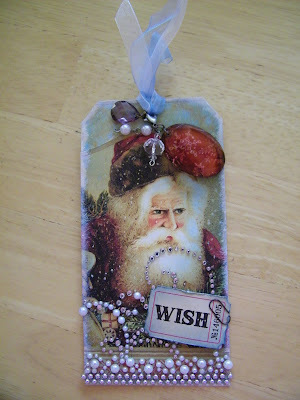 Here is the supply list that Tim Holtz 12 Tags of Christmas used, so if you feel incline to hop to his blog you will know what products you will need. 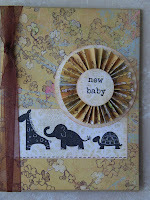 I used most of what was on the list and have mention the stamp changes on this post. 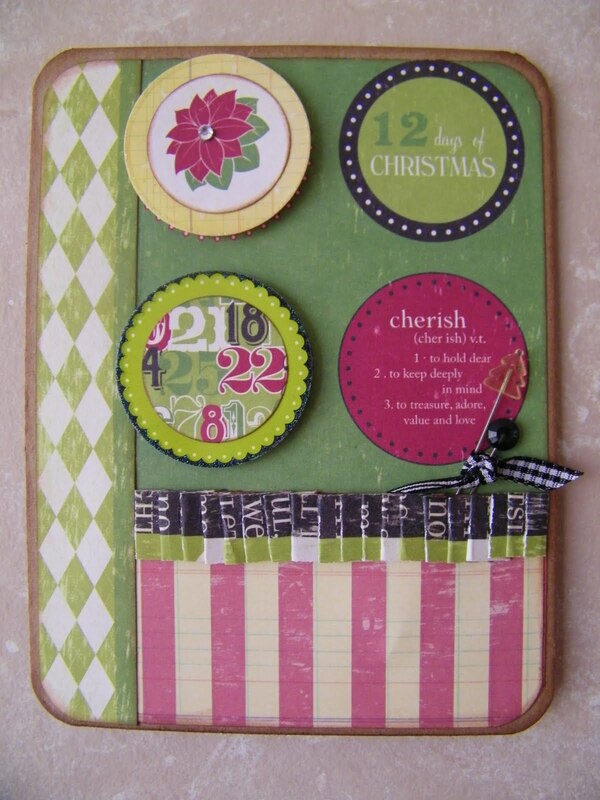 This is my take on the Tim Holtz 12 Days of Christmas Day 1. There are a lot of wonderful and yet challenging techniques that go on with the excitement of all that participates in doing the challenge. 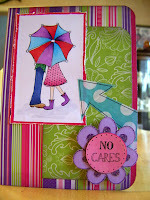 supplies: (ranger) craft sheet, heat tool, ink blending tool, mini mister, distress inks/stormy sky/tumbled glass/faded jeans/vintage photo/walnut stain, distress crackle paint/picket fence, glossy accents, wonder tape, paint dabbers/snow cap, perfect pearl mists/pearl, #8 manila tag; (idea-ology) mini pins, mini clips, adornments, jump ring, grungeboard, grungepaper, trimmings, sanding grip; (sizzix alterations) rickety house bigz, on the fence on the edge, notebook texture fade; (tonic) scissors; (stampers anonymous) winter sketchbook stamp set, odds & ends stamp set; (misc.) sparkly fluff, prima twig, holly garland, mica, q-tip, hot glue. I didn't have all of the supplies nor either the rickety house or the fence dies, I just drew my own. I think they look pretty good if I do have to say so myself. I used his tag as a sample jump off and did my own thing, he does encourage you to use the supplies you have on had and to be creative. Not to late to join in and get started. 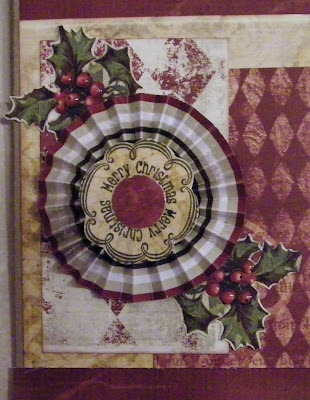 Make sure also to join in at 12 Tags of Christmas Group - Christine Cooper Hatchell is the creator and she has a wonderful blog at Scrapbooking Technique also full of projects and techniques. Now I better get busy on Tag 2. I made this ornament in a matter of minutes. 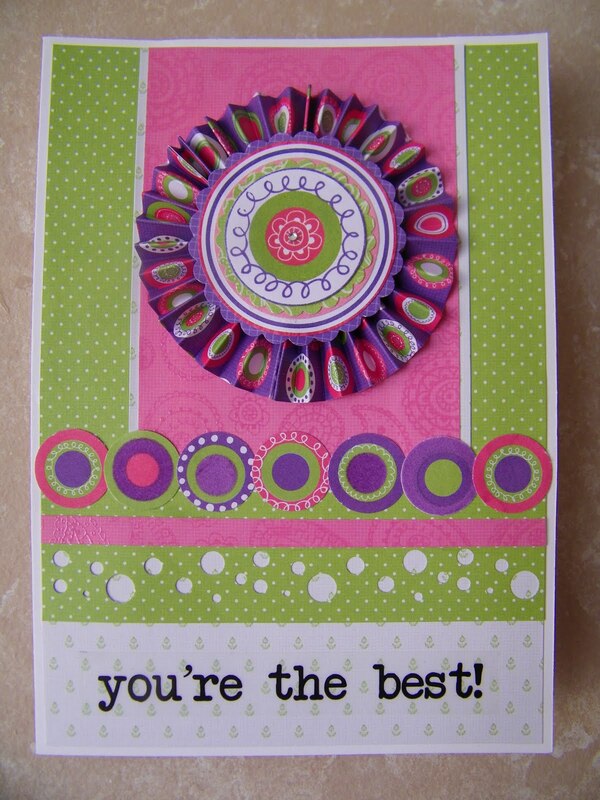 It takes one sheet of paper, Marvy 2 1/2" scallop circle punch, adhesive, sheer ribbon, some buttons and beads. I used the Imaginisce Cottage Christmas Swirly Snowflake paper. 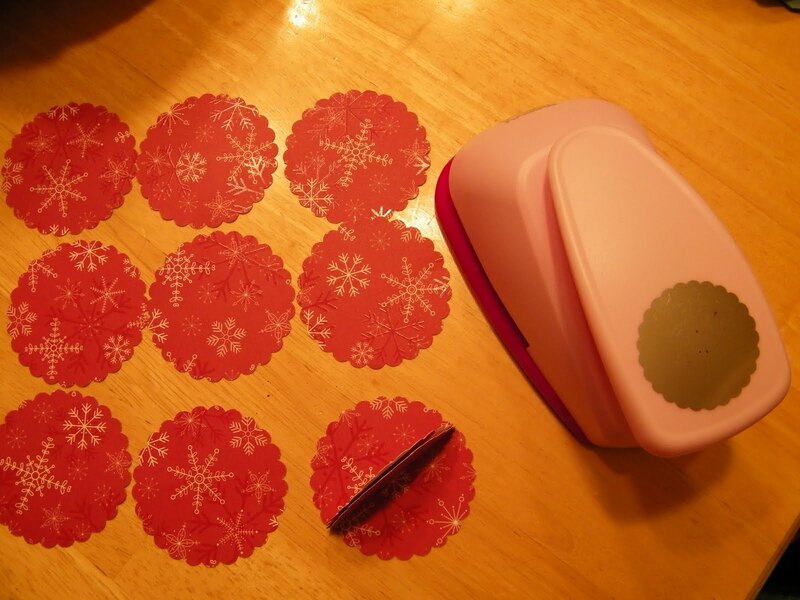 I punched out 10 scallop circles from the Marvy Pink Scallop Circle Punch. 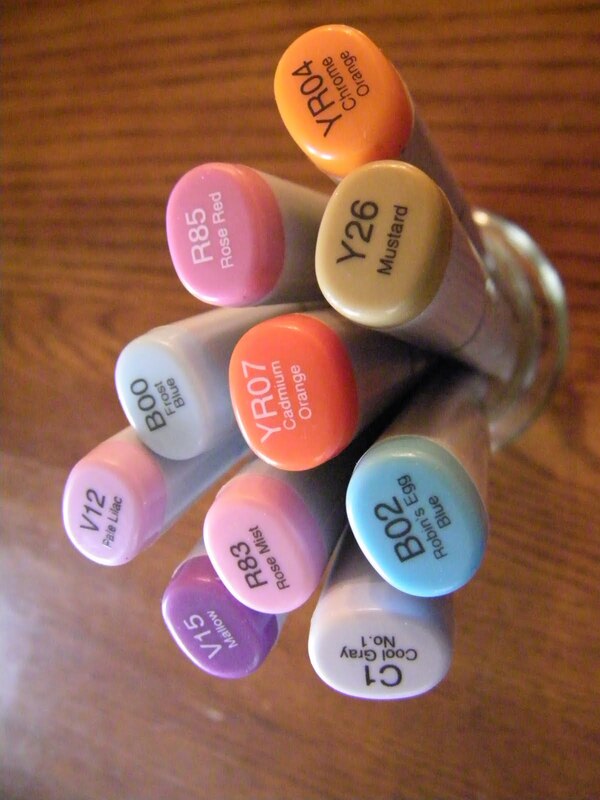 Sorry about some of photos, it is difficult to take photos when it is gloomy outside. Start by scoring 2 of the circles in half. I used my Martha Stewart Scoreboard. Glue the two pieces together-make sure that the scallops match up. Here is closer look. Start adding the scallops one by one and as you add them you score each one individually until you have all 10 pieces together. 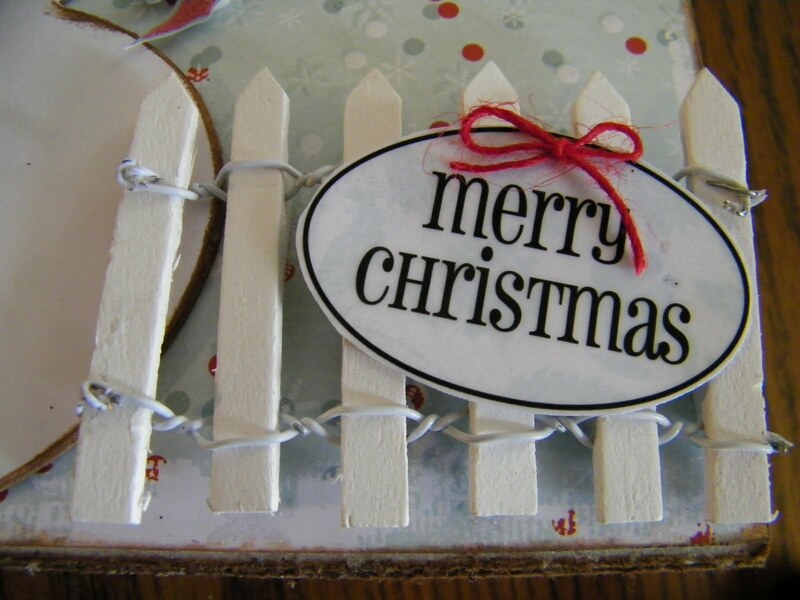 Make sure not to glue it closed until you added your string for your hanger. 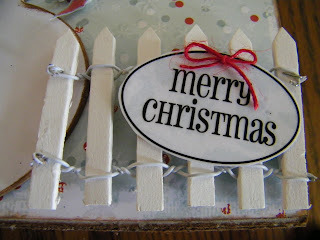 I made my hanger from a piece or red sheer ribbon, 2 buttons and a bead. I hope you enjoy the quick tutorial and make some for your tree or to give as a gift. The theme for the December Tag Swap is: Wishing you a Pink Winter Wonderland and Robin from My Pink Stamper has donated a wonderful set of Winter Punnies Stamps to give to one lucky winner who creates a tag inspired by the theme. 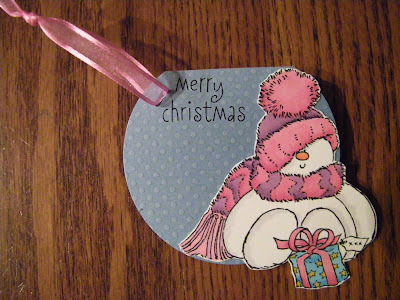 So this is my tag for the Pink Winter Wonderland theme and swap. Of Course I love Copics and here are the Copics that I used to create my Snowman Tag along with Memento Ink. 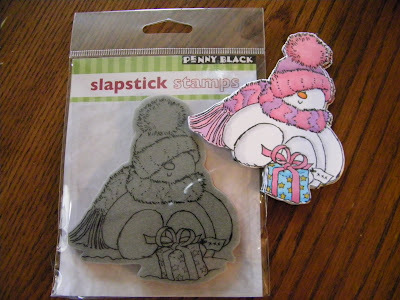 This is the cute little Snowman that seleted from Penny Black Slapstick Stamps. He is just to cute holding onto his present that he is going to be giving away. I thought he was just perfect for the swap. I made a total of 8 tags for the swap but decided I was going to swap one with a friend here in town that is also doing the exchange. 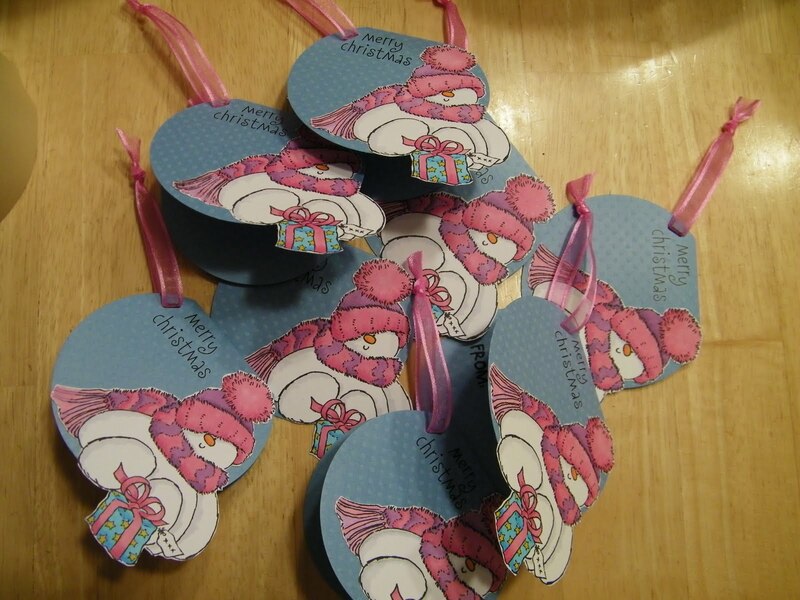 So 7 will be going out in the mail to KinderStampO and I can't hardly wait to see the ones I will get in return. Make sure to go to KinderStampO to get all of the details for the swap you still have plenty of time.